How Should Police Present Themselves? THE MATTER OF HOW POLICE SHOULD LOOK AND ACT ARE IMPORTANT ISSUES FOR EVERY FREE SOCIETY TO CONSIDER. Since the early days of policing in the mid-nineteenth century, reformers like Sir Robert Peel thought police ought to be a separate function from the military; moreover, they ought not to look nor act like soldiers. Their mission is quite different. (Though we do see some characteristic actions of community oriented policing used by the military in Iraq and Afghanistan.) 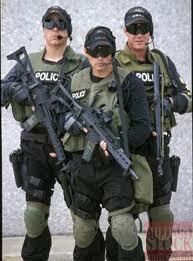 Simply stated, police should not look (or act) like soldiers except in very limited tactical operations. Having served for four years as an active duty Marine, I knew that when I went into policing it wasn’t to continue being a Marine. The kind of police we needed were police with formal educations—they would be the most likely to be open to what I was trying to do; they would be the most flexible. A higher educational requirement seemed to be the first and finest step toward getting my department to where I wanted it. In Burnsville, police were to be highly-educated before they started to practice. With the support of [City Manager] Patrick McInnis and the city council, I established a four-year college degree requirement. Today, Burnsville still maintains the four-year degree entrance requirement we established in early 1969. They are one of the few departments in the nation to do so. It turned out to be true. Burnsville officers immediately noticed a change in attitude from the people they contacted while wearing their blue blazers. The city was proud of their officers. Since that time, few police departments in cities or on campuses have been able to get away from the military-style police uniform. Instead, there has been a drift toward looking more like the military by authorizing the wearing of BDUs — “battle dress uniforms.” This has primarily occurred since September 11, 2001. While non-military uniforms seemed like a good idea I never found any research that actively supported them. That is until I found this article by Karl Bickel. The traditional military-style police uniform. “Some departments have seen resistance from the public to the move toward dark colored BDUs for daily wear by their patrol force. After changing from a more traditional uniform of tunic, matching trousers, white shirt and black tie to an operational ‘American SWAT’ type uniform during 2004 and 2005, the North Wales police in the UK saw pressure in 2010 to return to the traditional look. A survey found some citizens had less confidence in the ‘professionalism and honesty’ of the officers patrolling in what has been referred to as the American SWAT type of uniform… The Spokane Washington police department has also been urged to move away from what has been characterized as a black jumpsuit that looks much like BDUs in order to rebuild trust in the community. A city councilman who is also a former police officer is at the forefront of the movement for change. He believes the ‘militaristic black jumpsuit’ may be a contributing factor to the dwindling public trust. An example of a non-military or blazer-style police uniform which was worn in Burnsville, Minn. as the primary uniform (1969-72) and in Madison, Wisc. as an alternative uniform (1973-93).
. The results showed that the respondents believed the officers in the class ‘B’ uniform were more approachable and they preferred to have this officer respond to their call for service rather than the officer in the BDUs. The issue of how police present themselves regarding their image is an important one and should not be allowed to drift away. 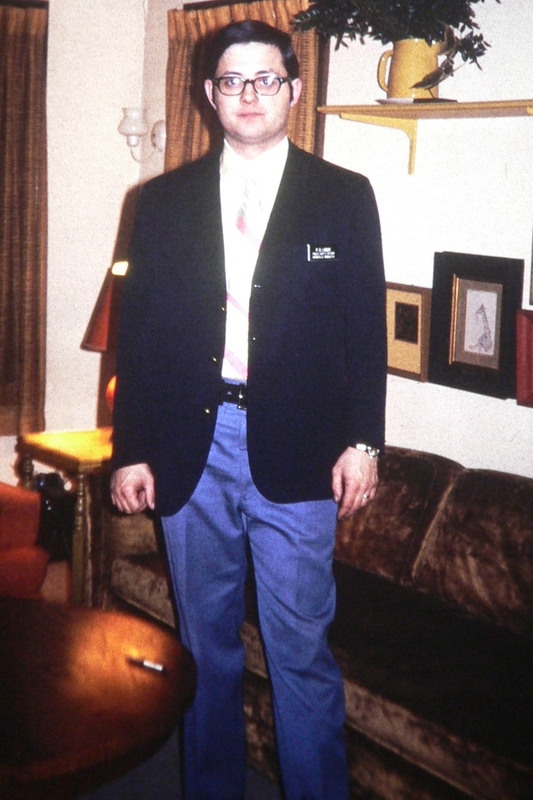 In Madison, I authorized the wearing of a “blazer style” non-military uniform soon after I arrived from Burnsville in the early 70s. To me and the community, it made a difference. Soon our citizens were beginning to perceive their police officers as more professional. Of course, it was more than just looks — it also had to do with how we were behaving; that is, acting like professionals. Burnsville Public Safety Officer Paul Linnee, circa 1970. 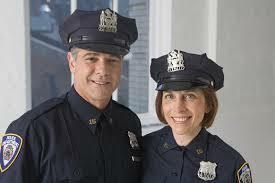 With regard to today’s policing, the blazer-style uniform should always be an option and, in some instances, mandatory. Posted in police, Uncategorized and tagged battle dress, Burnsville, community policing, Karl Bickel, madison, Minn., non-military uniforms, Paul Linnee, respect, trust, Wisc.. Bookmark the permalink. I continue to find your commentary and musings of great interest. Keep it up! Regarding the above comments from the previous article about the police trying to connect with the community from that police commander, the commander seems the forget that citizens are feeling stressed, anxious, and being challenged by the police or unable to challenge the police when they see a police car pulling them over, seeing a cop car patrolling their neighborhood, cops threatening people with arrest who are filming police misconduct/bad behavior, and/or when the people tried to have peaceful protests regarding their civil, political, social, and economic rights. There is a report on the Internet about New York State trying to pass a law that makes it a felony to annoy a police officer (you get four years for doing it). What if I saw a crime in progess, and I tell a cop who is either on his/her lunch break, about to go off shift, is lazy, and/or corrupt and then I get arrest under that new law if it get pass? Where is your community support then? I also believe that people are getting stressed and anxious when you have undercover cops inflitrating peaceful movements,without any kind of legal justification, occupied key positions in those movements, feeding information to their fellow officers about the movements’ plans, and then acting as provocators to incite mob riot action. There was this protest in Canada where some people got arrest and some of the protestors notice that one of the arrested persons was quickly release by the cops and notice that the arrested person had the same footwear that the riot police were wearing and they quickly deduce that that person was a cop and they demand an inquiry into the matter. It is creating fear in the entire community where you don’t know whether the person you are talking to is a police informer or and undercover cop. I also wish cops get rid of those sunglasses when they are on duty. Some of those sunglasses are so thin and slit that they make the cops look like Cylon robots from the 1978 TV series Battlestar Galactica and/or the robot Gorot from the 1951 movie The Day the Earth Stood Still. I would like to talk to a human being not some alien from outer space. If a cop told me to remove my sunglasses, can I tell him/her to remove his/her sunglasses at all, both me and the cop wanted to positively identified each other if one or both of us step out of line? State police forces in the 1920s look like US military men with their tunic jackets, high knee jackboots, Sam Brown belt with a belt going diagonally across their chests, US Army style jungle campaign hats, adoping military titles and rank insignia like Corporal, First Sergeant, Major, Colonel, etc., and using words like “barracks” and “troop” to describe their police stations and their command structure. I recall watching TV regarding the people in Anaheim, California protesting the police shooting of a young Hispanic this year or last year. The police were in full combat gear complete with helmets with automatic assault rifles backup by armor vehicles and helicopters. It look like something from Central and South America of the 1960s, 1970s, 1980s, and 1990s. It was downright scary. Times have changed and police need to have the uniform and weapons to counter the calls and people we deal with. Also, as an administrator, the cost of the blazer and pants are more money than the new light weight BDU style uniforms. Criminals have gotten worse. There is no way we would get respected by citizens or criminals by wearing those old looking bailiff uniforms. They are not practical and not safe for officers to wear. Most dont but wearing a blazer and a suicide tie will not help either. The ties were “pull-aways,” just like smart detectives wear a suit and tie. This is a cause and effect issue, whereas police are a reflection of the society they are policing. Chief Cooper, I would argue that in the little corner of the world you controlled as a chief, you transposed cause with effect, and hoped to change society by dressing your officers in a uniform that some believe made them “appear more approachable”. I would also argue that your position is based on the oversimplification of a complex relationship between human beings, the roles they play, and the circumstances upon which they interact. If police officers were simply customer service agents whose role was only to amicably interact with an always compliant public, then your position may carry weight. But that is not the case, and, for the same reasons that necessitate the existence of laws and their enforcers in the first place, it will never be the case. The subjects in the Johns Hopkins study would of course prefer that a “more approachable” officer respond to their calls for service. Most folks would rather interact with a friendly appearing person no matter the circumstance. But what calls for service are we talking about? If one’s call for service is an assault in progress or gunfight, do you suppose they particularly care what the officer LOOKS like? Aside from being professional in appearance and action, I imagine that person would take a pragmatic or even indifferent view as to what the officer was wearing. And do you suppose the officer responding to such a call for service has a preference as to their appearance? I expect they do, and it’s a matter of form following function. And the scales should tip in favor of most anything that gives the officer an advantage that will help them succeed in their given task. Asking officers to wear business suits is analogous to putting up an attractive wood privacy fence around a prison yard. It looks great, but it is insufficient for the task at hand. Chief, we ask officers to bridge the gap between the civilized parts of society and the depraved, deprived, or downright evil parts of society. Police officers, with the utilitarianism of their “military”-inspired uniforms, their attitudes and demeanors influenced by their experiences and mission, and their task of policing people from all walks of life, are placed in the position of reminding everyone, even otherwise upstanding citizens, that they can be held accountable for their actions. It also reminds them that officers have to be prepared to meet evil with an aggressive and decisive response. I think these things produce uncomfortable feeling for most people. Overemphasizing officers’ approachability at the expense of other attributes ignores the relationships, roles and circumstances upon which humans interact. Like people in general, some officers are friendlier than others. Some situations encourage an officer to be approachable. Other situations encourage or demand the exact opposite. Regardless, trying to put officers in a blazer, asking them to uber-approachable, and then hoping the problems that challenge society and the police profession will be solved to any significant degree is utopic, mixes cause and effect, and simplistic. Chief Cooper, the answer posed to us in your question “How should police present themselves?” is this: Professionally, competently, and properly equipped to deal with the diverse situations we expect society may present them. Dave, it’s complicated… I agree… but a dialogue is necessary about a lot of the things we do because “that’s just the way it’s always been.” You are on target about the way police present themselves — professionally, competently, and properly (trained and) equipped! Thanks for the comments. A Question for Today’s Chief of Police: Whom Do You Serve?